We've got lots of birds at home. Here are a couple of old pictures of the first two. This is Iibui; he's a cinnamon cockatiel. 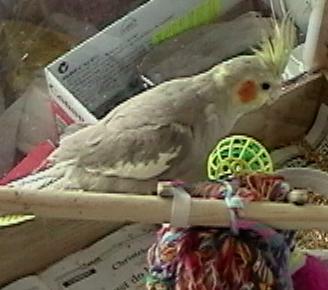 He's still got baby tail feathers in this picture. In real life he's grown up quite a lot and now has a nice consistent shiny colour and a long tail. 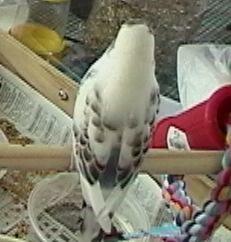 This is Snowy; he's a hyperactive budgie. He's a bit bigger now; this is when we just bought him. He's hard to catch, so you can only see his back here.